Nepal is an amazing place and Kathmandu is an incredible city and I had a teriffic few days there earlier in the year. It was my first trip to the city and it was well worth a visit despite the ridiculous state of the roads in the town (dirt, full of pot holes, generally in terrible condition!)﻿. I recommend a visit to all. Anyway, my trip was over and it was time to start the journey back home to Australia and taking me out of Nepal was Thai Airways. Thai operate a daily Boeing 777-200 to Kathmandu and the widebody service is definitely my preferred method of travel from Nepal (compared to Malaysia Boeing 737 and Silkair A319/20). After going through numerous checks just to get into the terminal and check in it was time to hit the Thai Royal Silk Lounge. 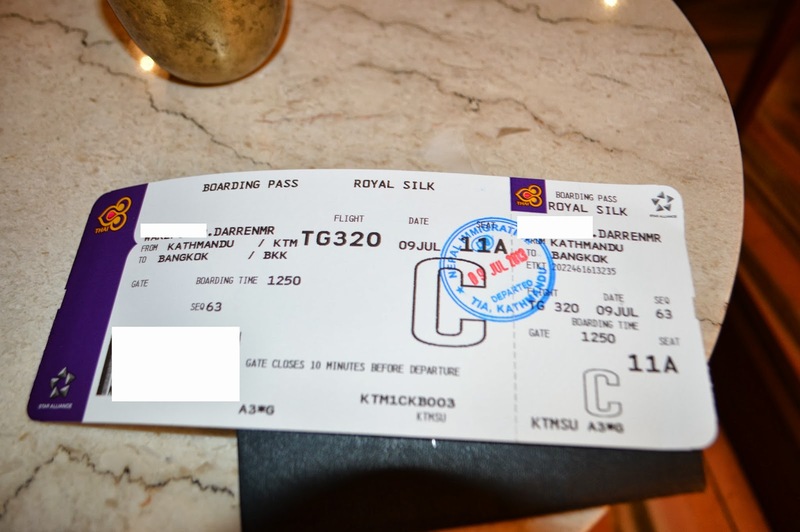 Thai is one of the few airlines who operate their own lounge in Nepal. It is quite basic but it's a relaxing oasis compared to the madness of the city just outside! It's worth noting that the lounge is before the main security check so allow plenty of time before boarding to get through it. As you can see above, I had managed to get my preferred seat on Thai's B777 business class cabin, 11A. It's a bulkhead seat with loads of space. My partner would be sitting beside me in 11B. Eventually it was time to go through the security process and head to the holding area. When boarding was called there was a further security pat down to go through with separate queues for men and women at the gate. I think I had been security checked about 5 times since arriving at the airport. They don't leave anything to chance here in Nepal! It was time to climb onboard HS-TJD, a 16 year old Boeing 777-200. Despite her advanced age she is still in great shape! The weather was cloudy with intermittent showers of rain, chances of viewing the Himalayas on departure were looking very slim indeed. I had chosen the left side for the best view. Upon reaching the top of the stairs the crew warmly welcomed me on board. It was only a matter of a few minutes before I had a wet towel and glass of champagne on my table. The business class seats are older angled lie flat style but they are very generous for regional flights. In a 2x2x2 configuration with huge seat pitch and nice wide aisles these aging seats are still very comfortable. The drinks service started and I stuck with the Piper Heidsieck champagne, to go with it some roast pumpkin seeds in a packet. It's always disappointed me that Thai don't serve warmed nuts in a bowl at this stage of the flight. The prepackaged nuts or seeds are very 'economy' class in my opinion. It's worth noting that the food for this service is loaded in Bangkok by Thai's own catering service, and is not produced in Nepal. So by the time we are eating it has already been stored in the aircraft for many hours. As usual with Thai the first course was salmon, I am utterly sick of seeing this on Thai menu's. THAI: PLEASE STOP SERVING SALMON CONTINUOUSLY. We need a choice of starter and one of them should NOT be fish!!! The lamb was fatty and I didn't particularly enjoy the dish at all. So far, entree and main, both a fail. Overall a disappointing meal experience. I have mentioned it before but I find Thai's catering in Bangkok rather lacking. I would like to see a choice of starter and mains presented on proper plates not economy class dishes. The service during the meal was exemplary though which was pleasing. I'm glad we made it down without having to fly through that one! Looks like it may have been a rough ride for some. I dislike turbulence! All too often Thai uses remote gates at their hub of Suvarnabhumi. You are then herded into buses for a long journey across the tarmac. There is no special treatment for business class passengers either. I can't say I hated this flight, it was very comfortable and the service was nice. But Thai is really starting to fall behind with their inflight catering in business class. The lack of choice for a starter, the main meal presentation, the obsession with salmon, the pre packaged nuts, they are all areas to improve upon. And Thai please manage your gate allocation in a more efficient way and stop with the bus gates!! What a dissapointing meal! The snapper sounded nice :) I do agree with you though, they need more than one started other than salmon! Another great trip report, the 777 looked in great condition for its age.